In the digital age we live in, most people would say that typing is much more efficient than writing by hand. Despite its questionable lack of efficiency, I have always preferred the latter, and was shocked to find that this was considered abnormal in college. Except in classes where computers are prohibited, I have even been asked explicitly by classmates why I would choose to write my notes by hand. This is a question for which I have never really had a good answer. I like the smooth feeling of the pen tip sliding across the page. I like how everyone’s handwriting is unique, never a replica of typed print you would see in books or the newspaper. Plagiarism is impossible, even for the most minute of your ideas, even the most insignificant of your shopping lists. Aside from the arbitrary reasons above, there are two main reasons why I choose to write my notes by hand. First of all, writing has always been my escape. My stacks of filled journals back at home serve as proof. You give me a pen or a pencil and paper, and I’m set. No battery, no WiFi, and no circadian-rhythm-threatening blue light required. A true escape, punctuated by the dots of my apostrophes, and not the inescapable draw of social media, one click away, or the college procrastinator’s delight, the beckoning of e-mail. Secondly, it’s all too easy to feel inadequate while writing, to simply delete the last two paragraphs of words and say they are not good enough. If I write by hand, I simply can’t doubt myself that much. I have to see what it looks like, on the page, and then physically get a new piece of paper or scratch my work out if I decide it really isn’t adequate. This gives me more room to brainstorm, less room to judge. 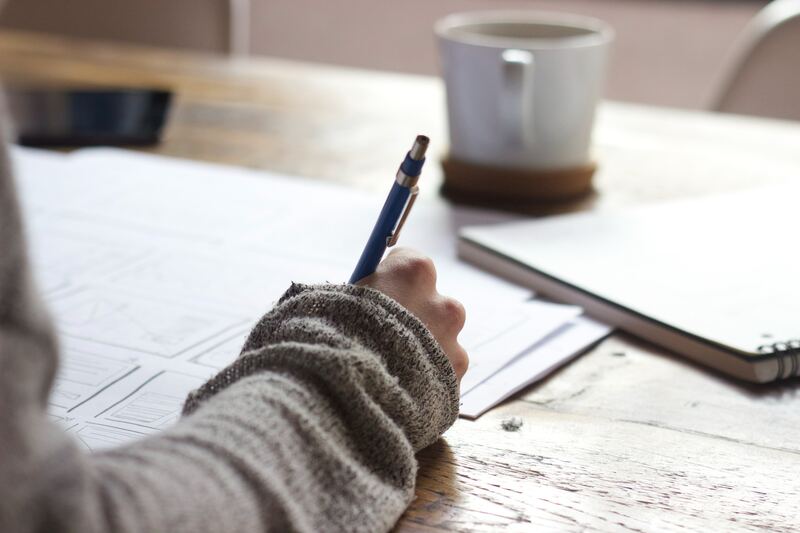 I’m certainly not alone in thinking there are benefits to writing by hand—research has given a lot of support to handwriting’s merits, particularly in the domains of learning new information—and thus being especially relevant to college students, like me. For example, it has been experimentally shown that handwriting is very important in early learning for letter recognition in children. In a study with 4-year-olds who were taught to either hear and say letters, or to write them, functional magnetic resonance imaging scans—which show brain activity during tasks—showed that only in the writing condition did the children have brain activation of the visual regions associated with letter recognition (James, 2017). In another condition of this experiment, writing and typing on a keyboard were compared, with only writing resulting in brain activation of the letter recognition region. In another study, adults were trained produce new characters either by writing them by hand or typing them on a keyboard. It was shown that they more often mixed up the mirror images of the characters they’d learned when they had typed them compared to when they had written them by hand (Longcamp, Boucard, Gilhodes, & Velay, 2006). The authors of the study suggest that this is due to the way that we come to represent new characters in our memory, and how this is associated with the motor activity we perform during this learning period. Some research has even shown that the cognitive load—the mental energy, essentially—associated with typing is greater than that associated with handwriting. In a study by Shibata and Omura (2018), adults were asked to memorize words and either type or write them down. In this study, typing was shown to interfere more with memorizing the words than handwriting. In addition, individuals were better able to remember words when they were asked to write words than type them. That’s not to say that typing doesn’t have its benefits when something needs to be transcribed quickly, nor to deny that I typed this article on my computer. However, I hope that, if you’re a student like me, or someone who wants to really remember what you’re writing, you’ll consider reaching for your pencil next time, instead of your laptop. Longcamp, M., Boucard, C., Gilhodes, J. C., & Velay, J. L. (2006). Remembering the orientation of newly learned characters depends on the associated writing knowledge: A comparison between handwriting and typing. Human Movement Science, 25(4-5), 646-656. Shibata, H., & Omura, K. (2018). Reconsideration of the Effects of Handwriting. ITE Transactions on Media Technology and Applications, 6(4), 255-261.